North Korean leader Kim Jong-un is unlikely to visit Russia this year, Seoul’s top envoy in Moscow said Thursday, amid speculations about his summit with Russian President Vladimir Putin. Ambassador Woo Yoon-keun said it is difficult to predict when the North Korea-Russia summit will happen, given that a second summit between North Korea and the US and Kim’s visit to Seoul have yet to be confirmed. 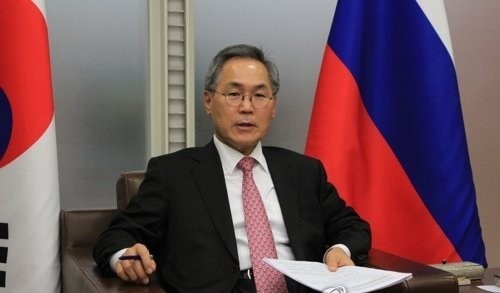 “The mood for Chairman Kim’s trip to Russia took form after September,” Woo told reporters, citing visits to Pyongyang by Russian Foreign Minister Sergey Lavrov and Valentina Matvienko, the speaker of the upper house of Russia’s parliament. Woo is in Seoul for the annual gathering of South Korean ambassadors and heads of overseas diplomatic missions. “There was also anticipation (in Russia regarding Kim’s visit) around October and November, but his visit to Russia seems unlikely this year,” Woo added, noting that the Kremlin expects the North Korean leader to come next year. North Korea has sought to improve relations with neighboring countries and restore soured ties with its traditional ally China in an attempt to break away from isolation amid heavy international sanctions over its nuclear and missile weapons programs. Asked whether Russia is wary of China’s growing influence over North Korea, Woo noted that Russia does not seem bothered. “In terms of relations with North Korea, Russia tends to cooperate well with China and publicly has said it is closely coordinating with China,” he said. Meanwhile, South Korea and Russia are seeking to hold a summit in the first half of next year, he said.